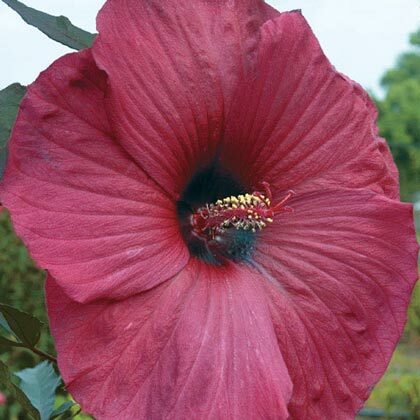 Big Red Hibiscus | Gurney's Seed & Nursery Co. The large, saucer-shaped flowers of this excellent garden performer really pack a punch of color, style and beauty. Pollinators like butterflies, hummingbirds and beneficial bees are attracted to the bright red color and will become frequent visitors to your landscape. Looks amazing when used as a focal point planting or integrated into a mixed perennial border. Despite its exotic good looks, Big Red is easy to grow and maintain. Tolerant of many different soil types, so long as the drainage is good. Deer and other garden pests tend to avoid this fast-growing hibiscus variety. Plant in full sun to partial shade for best results. Hardy in Zones 4-9. FoliageLong, deeply lobed and dissected foliage. Dark green with a coppery-red to purple cast. Red-purple stems. Flower FormLarge 8 - 12 inch diameter blooms that are open saucer-shaped with overlapping petals. Prominent pistil and stamen. BloomsAll Summer into early Fall. Soil RequirementsWell drained, but moist soil. CommentsHuge, 9" red flowers catch the eye, while heat and humidity tolerance ensure blooms even in the midst of summer. As if the large brilliant red blooms aren't spectacular enough, the tinted, deeply dissected foliage puts this plant over the top. Dark green foliage has a rich red-purple cast. The sturdy stems also exhibit the attractive red-purple coloring. The combo of blooms and foliage is sure to please anyone looking for big bold color for their landscape or garden setting. 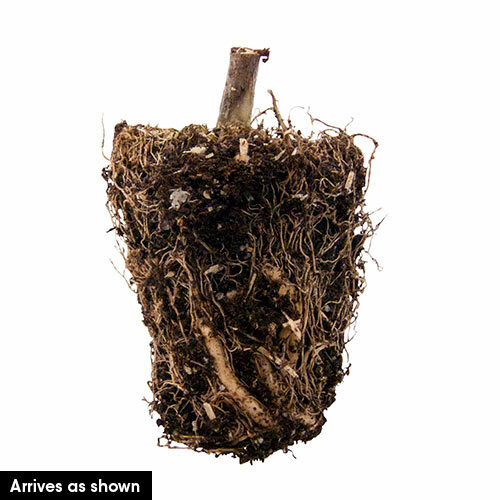 DepthPlant the crown 1" below soil level.